Fashion designers are known for pushing the boundaries of what clothing is and what it can do, particularly on the runway. But at one runway show in New York City this month, the outfits worn pushed even the boundaries of the fashion elite, challenging the apparel industry to recognize the power of 3-D printing technology. While 3-D printing technology is still in its infancy, advocates say it promises to revolutionize manufacturing and that the fashion industry needs to adapt. “The fashion and apparel world is still in cut-and-sew in the factories,” says Natacha Alpert, the curator of the 3-D Print Design Show. 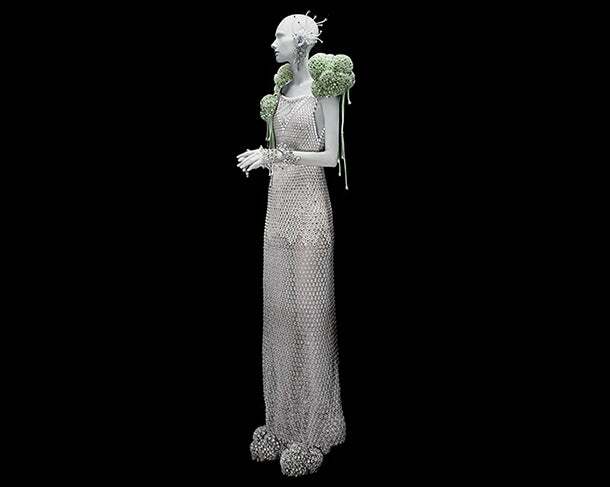 The fashion show, sponsored by Belgium-based 3-D printing software company Materialise, featured the work of 12 design teams and was a part of the Inside 3-D Printing conference during New York’s 3-D Print Week. Alpert is the founder of Miras3d, a consultancy that helps brands integrate 3-D printing technology into their long-term growth strategies. Prior to launching her own company, she worked for 14 years in the shoe industry with big-name brands including Nine West, Kenneth Cole, Timberland, Reebok and Dr. Martens. Most of the models strutted in ensembles adorned with 3-D printed components or featuring 3-D printed accessories. One show-stopping finale, however, was an entirely 3-D printed gown designed by Malaysian designer Melinda Looi, pictured below. While 3-D printed fashion is as much a conceptual comment on how technology and fashion can influence each other, it’s not always going to be relegated to such an exclusive set, according to Alpert. She says that, as 3-D printing becomes more and more affordable, more and more consumers will eventually have access to print their own clothing products at home. If she proves correct, then a lot of very powerful, legacy players in the clothing industry are going to have to reconsider and redefine their position in the fashion supply chain.